Kate Upton – what a BABE! Just use your imagination to experience her Actually Pounding It. Ben Huh is MicroPounding It! 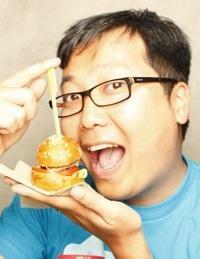 Ben Huh, founder of Cheezburger.com, is preparing to destroy that little burger. We assume, with such a tiny burger, that he will want fries with that.